If you're a Phoenix old-timer, you know what the suicide lanes are. They are lanes in the middle of major streets that allow travel in any direction in order to make a left turn from the street that you are traveling on. Used correctly, they are very good for traffic flow, as traffic doesn't need to stop if someone is making a left turn. Unfortunately, they get their name for a reason. If you've driven much around Phoenix, you may be under the impression that these lanes are designed to allow drivers to drive in them, usually with their right turn signal on, waiting to merge into traffic. They aren't. And so a lane that was designed to be used safely becomes extremely dangerous when a driver is going in a particular direction, looking over their shoulder backwards, in a lane that allows traffic in either direction. So don't do that. By the way, just driving along in a lane like this with your right turn signal on, waiting to merge, can get you a nasty ticket. 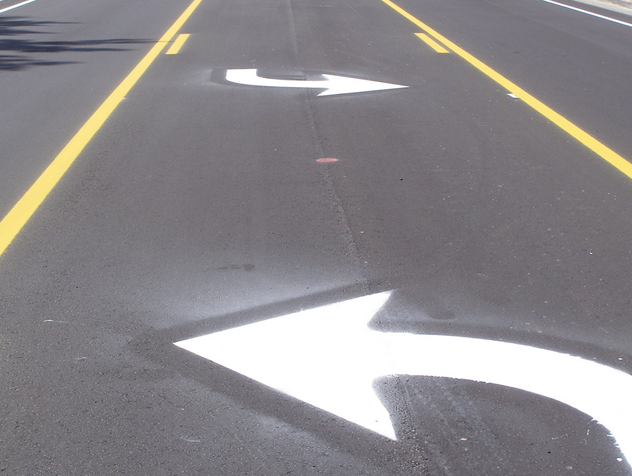 Most suicide lanes aren't marked with the turn arrows like in the image above, but that's how they should be treated. If you need to turn left, signal, move into that lane, watch traffic until it clears and make your turn. If you're unsure how to use the suicide lane, stay out of it. Chances are slim that you'll get a ticket for using one of these lanes incorrectly. But chances are so good that you will cause a collision that the lanes have come to be known as suicide lanes. Oh yes, and please look twice for motorcycles. Thank you.